After homeschooling in the classical method for several years now, I feel we have a solid understanding of the principles of this education method. However, that does not mean we rest with the knowledge already gained. I'm always seeking out alternate interpretations and ways to implement the classical model. 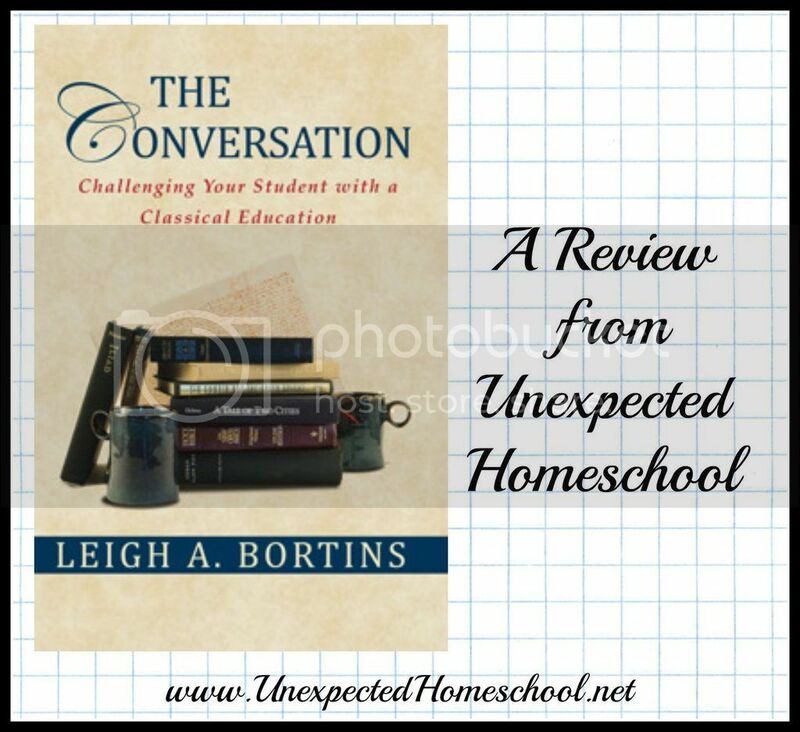 The Conversation by Leigh A. Bortins, available from Classical Conversations, is an excellent resource in the quest to develop the ideal education structure for your students. The Conversation is actually the third book, following The Core and The Question, written by the founder of Classical Conversations, Leigh A. Bortins. Each book in the set focuses on a different phase of the classical educational model: Grammar, Dialectic, and Rhetoric. The Conversation addresses homeschooling high school, or the rhetoric phase. Although The Conversation is not the first book in this set, it does have the ability to easily stand alone without its companions. 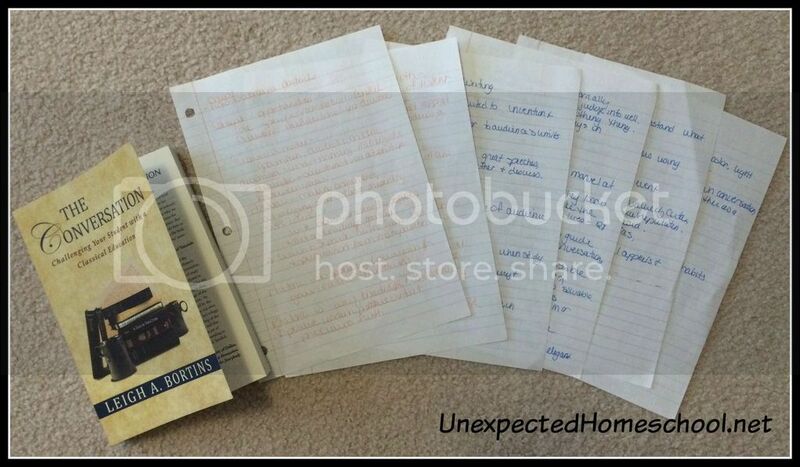 The book begins with encouragement and a brief outline of how to make homeschooling happen. It continues with a definition of rhetoric and the rhetoric stage of classical education. Even if you think you know the definition of rhetoric and how it works in education, you'll want to read the definition chapter carefully. The five canons of rhetoric: Invention, Arrangement, Elocution, Memory, and Delivery, are the basis for the rest of the book. Every chapter provides thoughtful and clear explanations of how the five canons apply to the topic subject. In addition, examples of conversations utilizing the described methods in real life are included. Finally the chapters conclude with a summary grid which break down the five canons of rhetoric into concise points for the subject at hand. Lastly, the book has a quick chapter on graduation, college admissions, and life after college. This chapter is mostly encouragement for the homeschool parent who worries about how to finish up the high school years. It is the perfect way finish The Conversation. For me, the review of this book came at the absolute perfect time. I must admit to having read (and owning) both The Core and The Question, and I was earnestly anticipating The Conversation. I have an eighth grade daughter who is doing more high school level work this year than middle school level. I was eager to read Leigh Bortins' take on rhetoric stage learning and perhaps implement some of her ideas this year during our migration to the rhetoric stage. While I'm normally a quick reader, there was so much information packed into this book - it's only 267 pages with the index and appendices - that it took me almost a week to finish! I did also take a copious amount of notes to ensure I remembered the sections which struck a chord with me. Quite possibly my favorite quote of the book, and one my daughter will be learning all about, comes from the chapter on rhetoric stage mathematics, "No subject is boring, because they know how to ask questions and make the information relevant to their lives." The Conversation taught me how to encourage those questions as well as better understand the purpose of the rhetoric conversations. To be honest, prior to The Conversation, I was a little vague on the high school level science and math implementation of a classical education. I understood the broad goals, as well as having classical curriculum to implement those goals. However, the why of the specifics were a little lost on me. It's hard to properly follow a plan, or to adjust it, if you don't understand the purpose. Thankfully, now I have my reading notes to fall back on when the confusion strikes. The Conversation is a wonderful outline and guide for any parent interested in providing their high school (rhetoric) age child with a classical education. It provides not only the background and foundation necessary to structure the rhetoric conversations, but also encouragement every step of the way! Please visit other members of the Review Crew to read their experience with The Conversation.